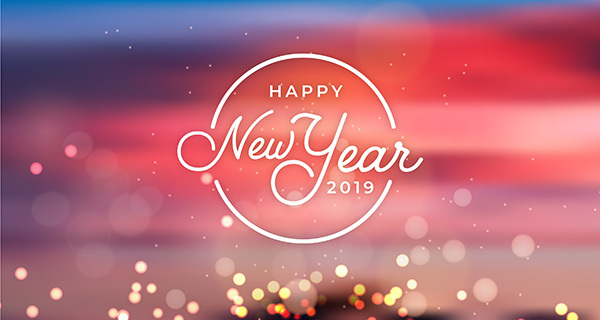 As we prepare to welcome the new year, I am filled with a feeling of excitement in the prospects of ushering a new year which signifies, not necessarily a new, but a fresh beginning. However, it is also a time to reflect on the year just closing. Looking back at all the people that I had met and the memories I carry, I came to realise how exceedingly fortunate I had been for the opportunity to work with some of the most amazing and talented people with immensely great personality. It is such a joy to be able to witness first-hand the excellence with which you engage your careers and the character and humility you show in doing so are truly inspirational. 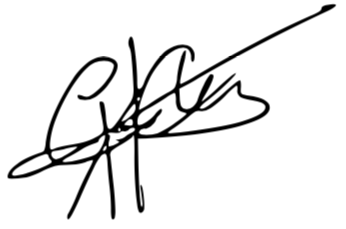 Next year marks the 7th year of my personal footprint doing business and investing in China. There are many interesting facts about the number 7. One of the oldest books in the world, the Bible, gives symbolic significance to the number 7 and relate it to the idea of divine completeness. The ancient world has seven wonders. Muslims on a pilgrimage to Mecca walk seven times around the Kaaba, the cuboid building at the centre of Islam’s most sacred mosque. There are 7 days in a week, 7 notes in music and 7 colours in the rainbow. And exactly 7 years ago, one of the UK’s leading commercial venture capital invested in our first China project. And throughout these 7 years in China, I have been blessed with meeting many people in my life. Their influence, their rebuke and their praise have all shaped me to be the person I am today. They are behind my every experience, the sum total of which is more than just an entrepreneur but a son, a CEO and above all, a friend. As entrepreneurs, a title I am a glad student of, I believe we are tasked to continually reinvent ourselves, each time bringing solutions to the community we have pledged to serve. When we are gripped with a sense of something greater than ourselves, we get the urge to be better, to do more and to exceed expectations and breach limitations. And suddenly, there are many things to accomplish in so little a time. However, the daunting task quickly turns into one of exciting joy and exhilaration at the prospects of making even one more client happy or helping just one more child’s dream come true. Over the years, I have come to personally cherish the valuable life lessons I skim from these moments, perhaps more than the material rewards of the complex process of entrepreneurship. The trust of a client, the courage of a colleague, the unwavering belief and support of a business partner and the dedication of staff member, whether in success and in failure, are all so humbling that I am sure all of us cannot do without such. Therefore, I find in my heart to acknowledge and appreciate each and every one of you for making my personal journey a learning and truly fulfilling experience. 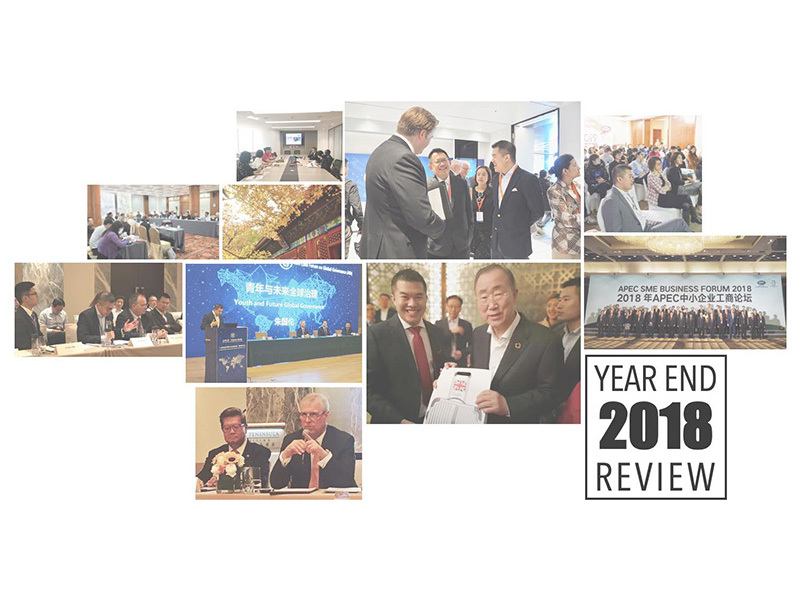 As has been my practice in the previous years, I would like to relate with you some events from last year that shaped the way we operate as a Company and those that left a lasting impression on me as well. On May last year, I was invited to preside the panel of the 10th 2018 World Chinese Economic Summit Roundtable held at the Beijing Peninsula. The organising committee and all the distinguished members of the Center for China for China and Globalisation (CCG) and the Asia Strategy & Leadership Institute (ASLI) are doing an excellent job in bringing to the spotlight the future cooperation and development of international relations. The summit was attended by leading entrepreneurs, scholars and officials from China, the UK and Southeast Asia. 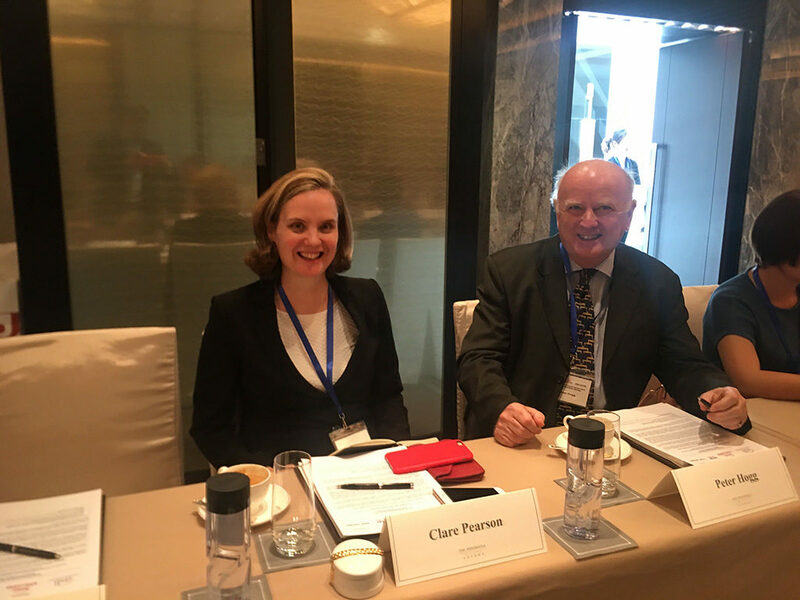 I had the pleasure of inviting Clare Pearson (Former Chairwoman at the British Chamber of Commerce) and Peter Hogg (Chairman at Beijing Asian Healthcare) to the forum. The respectable and legendary Malaysian tycoons Tan Sri Yeoh and Tan Sri Lee, as well as Prince Andrew, Duke of York, were panelling the summit. 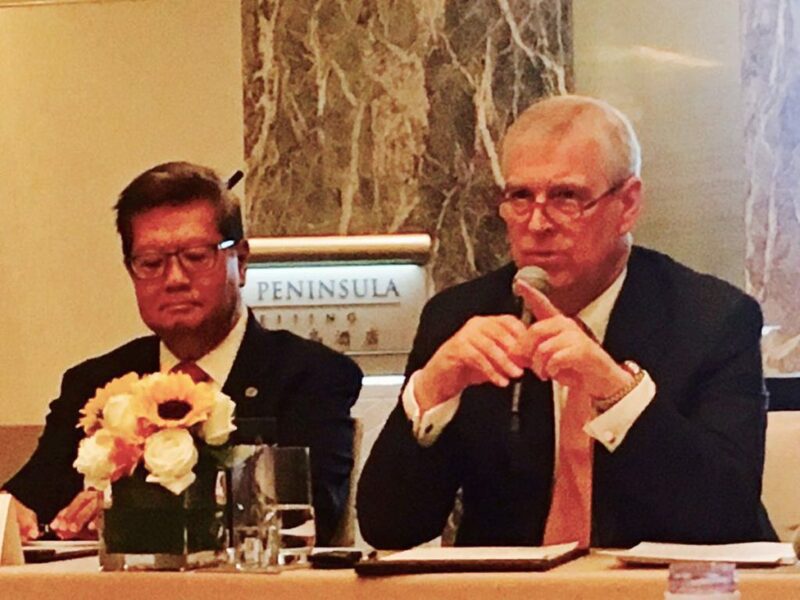 Picture: Tan Sri Dato’ Dr. Michael Yeoh (left) and HRH Prince Andrew, Duke of York (right). Picture: Clare Pearson (left) and Peter Hogg (right). Among the topics discussed included UK’s pioneering in globalisation and developing international commercial traditions and business practices, the East Asian Miracle of South-East Asian economies and how could China, with its advances in e-commerce, utilise these experiences for the success of the Belt and Road Initiative. Speaking at the event, I recall as HRH Prince Andrew’s remark to never let politics get in the way of business. He also stressed that entrepreneurship and education are crucial to truly global development, remarking his conviction that everyone in attendance must have come because each one embraced the central role entrepreneurship plays to build a better future for all, regardless of their nationalities. Myself a firm believer in the subtle but profound role of education in bridging the east-west divide, these remarks effectively puts a lot of what we do at LC Venture in perspective. That is why at LC Venture, the largest investment we have made to date is in the field of education. I am confident that education as a driving force for development and how education, rightly coupled with entrepreneurship, would be the best-suited vehicle to deliver the much-anticipated economic dividends. The event was important as it featured LC Venture and our work in a stage and context that is far-reaching and global. LC Venture featured on Xinhua News Agency, the official state- run press agency of the People’s Republic of China. Held at the beautiful Fragrant Hill Park grounds, this event marked a milestone moment for me and the China Going Global (CGG) Forum as it was the first time the Forum launched an exclusive event. Let me begin by thanking each and every one of the enthusiastic group of people who make the platform a truly global gathering. The CGG Forum was the brain-child of my crucial and formative years in the British Chamber of Commerce in China. 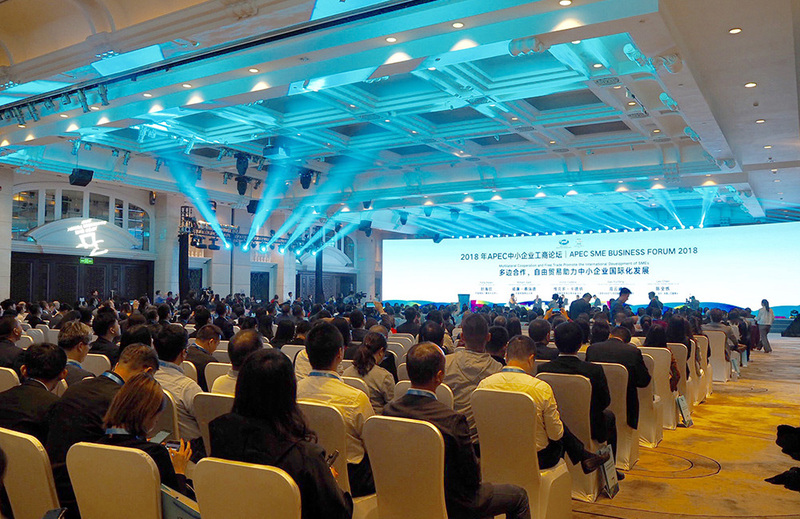 Aspiring to be truly global and forward in vision and composition, the forum has quickly metamorphosed and is en-route to become a successful point of confluence for public authorities and local and foreign businesses, especially SMEs, looking for business opportunities in China and beyond. 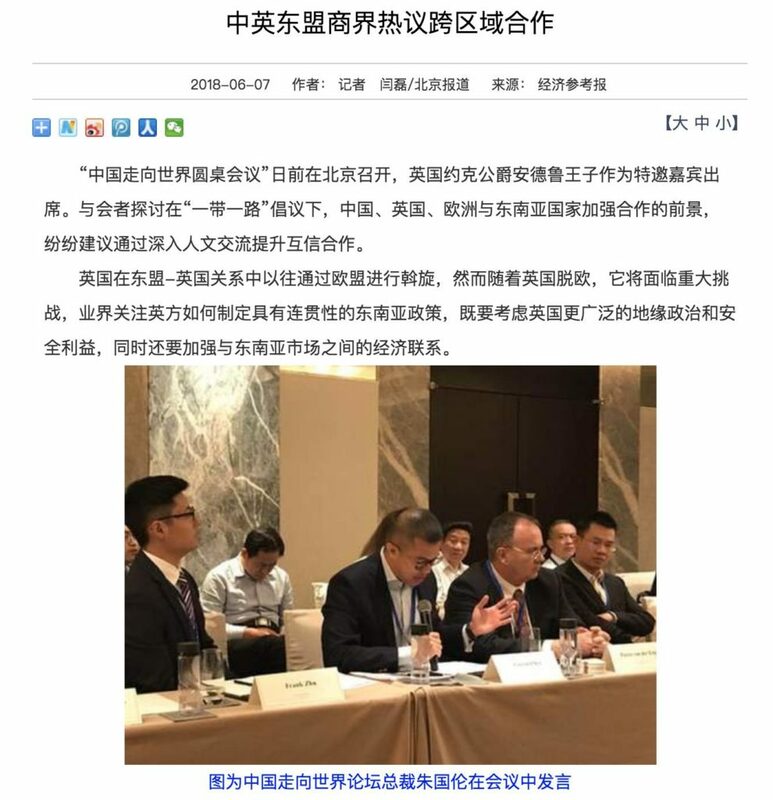 Exclusively self-sponsored, the event featured academic Chinese state officials, some business giants like DiDi and Ping An Bank, local and foreign entrepreneurs from Malaysia, Russia, the US, academicians, scholars and representatives of various business councils and across China. The choice to host the event at the Fragrant Hill grounds in itself speaks volumes as the venue marks an important location in Chinese civilisation and history. Over a millennium and half years old, it is a testament to sustainability that comes with vision. Picture: Jeff Astle, Executive Director, China-Britain Business Council (CBBC) at CGG Forum. Those in attendance had the opportunity to share their business ideas and to network among themselves. Representatives from the Chinese government, especially from the Hainan and Chengdu province administration and other local businesses also assured participants their readiness for cooperation. The Belt and Road Initiative (BRI) is promising trillion of dollars’ worth of investment along the silk road connecting the East and the West, and we intend to build the Forum as an ideal place to help and assist local and foreign firms to capitalise on the opportunities along the BRI. As we are working really hard to make the Forum a success, I would like to take the opportunity to share with you the Forum will officially launch a membership subscription on an invite-only basis in 2019. Details of the subscription procedure and fee structure will soon be communicated. On his recent visit to Beijing following his appointment as the Chairman to the BOAO Forum in May last year, I had the privilege of a private audience with H.E Mr Ban Ki-moon, former Secretary General to the United Nations and former minister of foreign affairs of the Republic of Korea. The BFA is modelled on the World Economic Forum and is called ‘Asian Davos’ which take place annually in Bo’ao, Hainan province. 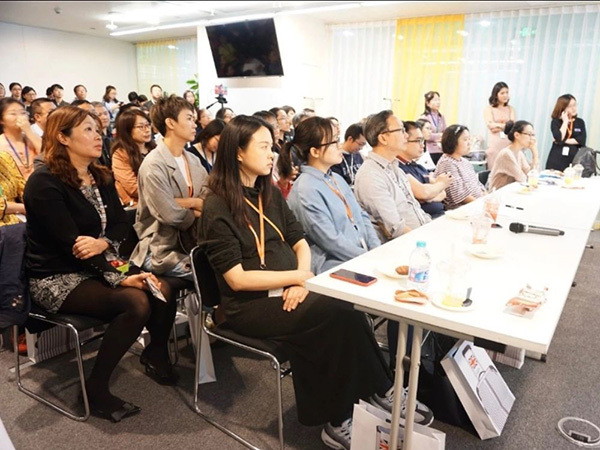 BFA has served as a venue for economic discussion for diverse public and private audiences in Asian countries closer towards their developmental goals and in promoting openness and innovation in solving global issues. LC Venture has been working closely with BFA under the leadership of its previous successors in achieving its aspirations and in promoting economic integration and I foresee that the wealth of diplomatic experience Mr Ban will bring to the Forum will play a vital role to bring Asia closer to the world. My personal appreciation goes to Mr Ban, for the warm and engaging time I had with him. During our conversation, I was able to share in his passion for the global citizen, which he is working tirelessly to equip and empower. He reflected how working at the UN, he was able to see how the world population is being marginalised and being torn apart by interest groups who exploit its diversity. He believes by nurturing a truly global citizen, we could harness the immense resources in the world to bring about sustainable development and world peace. 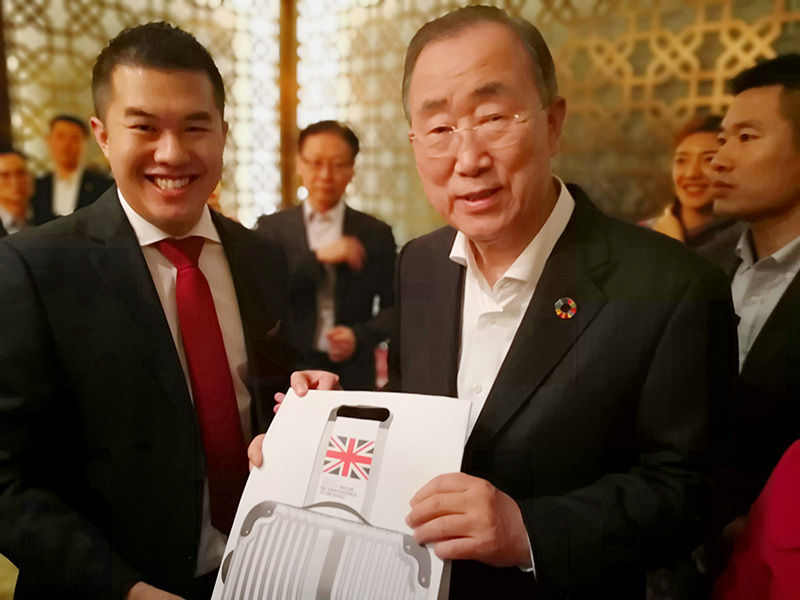 At the Ban Ki-moon Center for Global Citizens (BCGC) in Geneva and the Institute of Global Engagement and Empowerment (IGEE) in Seoul, Mr Ban continues to pursue the sustainable development goals and his commitment to the global citizens. With my Chinese roots and Malaysian nationality, and having spent the crux of my years at the UK, I could relate a lot with Mr Ban, because I had single-handedly seen and experienced this. At LC Venture, we have witnessed for years the wonders of a multi-cultural environment and multi-lingual staff and how indispensable they are for the success of a business. Our multinational staff that includes Africa, Europe, the Americas and Asia is a living proof that global citizenship actually is more than a concept. In the coming years, H.E Mr Ban Ki-moon has pledged to work together with us and both from his Offices at the Foundation and the BOAO Forum. 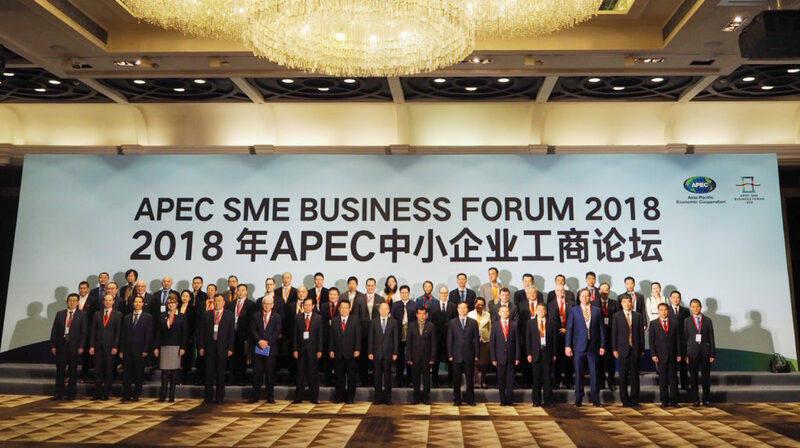 One of the most important events last year, we also had the privilege of working with the Chinese government to co-organise the 2018 APEC SME Business Forum, which is part of the SME framework of the Asia-Pacific Economic Cooperation (APEC). 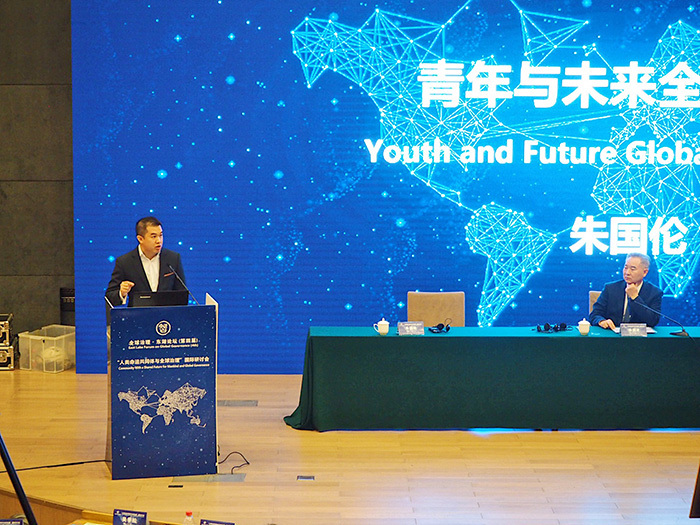 I had just concluded my brief attendance and closing speech at the 4th East Lake Forum on Global Governance, held at The Huanzhong University of Science and Technology on the 24-25 of Nov. 2018. The Forum invites guests from the relevant state ministries and domestic and universities, diplomatic envoys, experts and scholars from more than 180 countries. During my speech, I attempted to chart how far China has come to becoming global since its “Reform and Opening” in the late 1970s and the lessons learned and challenges ahead to China becoming a truly global country. Two days later, I was at Shenzhen for the APEC forum on SMEs. I would also like to thank the hosts, Shenzhen Municipal People’s Government, the China Center for Promotion of SME Development, the Torch High Technology Industry Development Center of the Ministry of Science and Technology, and the China International Cooperation Association of SMEs for their recognition of our work and inviting not only me but also reserving a number of VIP invitations for our Forum members. Accordingly, China Going Global Forum (CGG) of LC Venture was pleased to have led a delegation to Shenzhen to attend the APEC SMEs Forum. The Delegation consisted mainly of CGG members from countries and regions of China, the UK, France, Korea, Mid-Asia and Hong Kong representing industries from real estate, energy, automotive to investment, finance, art, education and consulting etc. Our members were provided with 2 nights accommodation at the Intercontinental Hotel in Shenzhen and were able to listen to first hand from business owners and corporate figures who have successfully worked across borders, localised their business strategies and take their products and services globally. 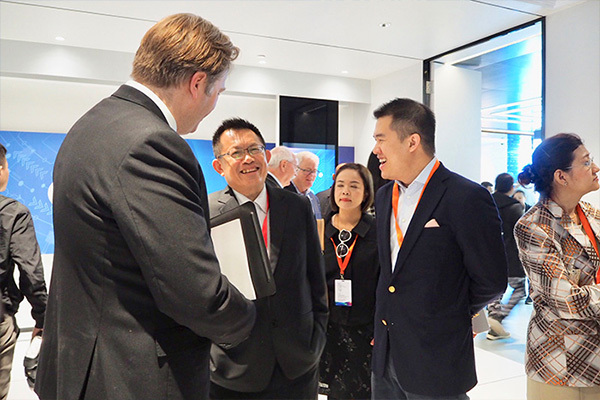 The Forum created an opportunity for CGG delegates to network with other industry professionals, speak to key decision-makers on a one-to-one and deepen their knowledge and grasp of the Chinese preferential policy towards SME’s and to foreign firms wishing to access the Chinese market. 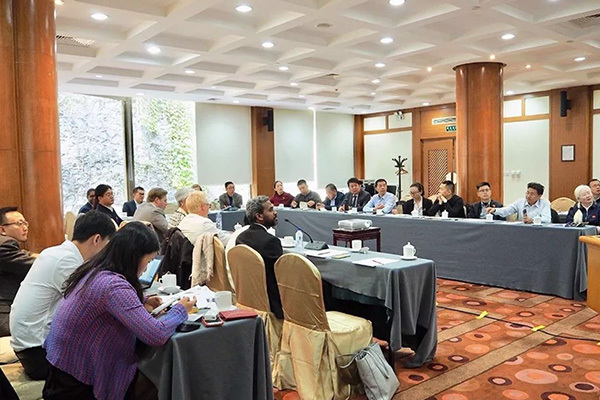 Our members were also able to expand our ties with state officials from Shenzhen, Qianhai Free Trade Zone and the innovative technology enterprises in Nanshan District, businesses and business councils and organisations from the business councils of the US, Australia, and Canada. 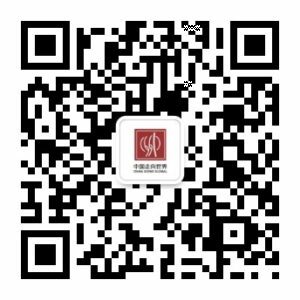 Parallel to the Forums activities, I personally hosted CCG delegates and other entrepreneurs and business owners at Le Petit Chef InterContinental Shenzhen, China’s very first 3D visual art French fine dining restaurant for two private dinners. 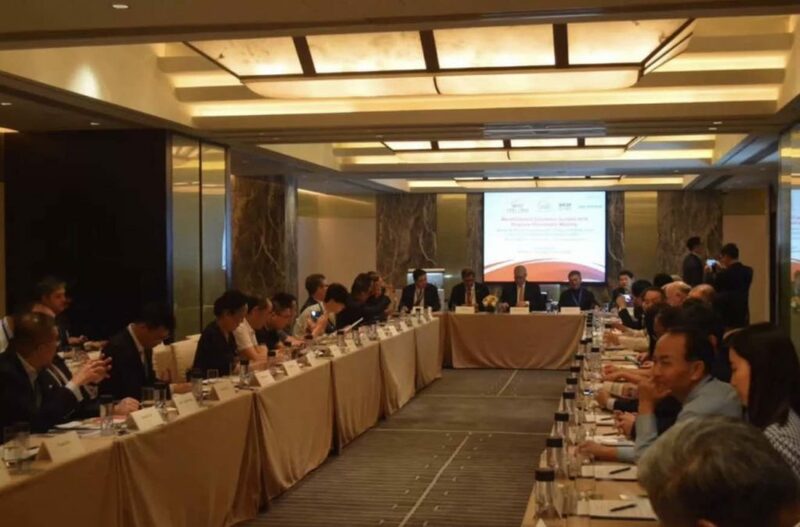 Over the course of the dinners, CGG members had the unique opportunity to discuss a wide range of topics including the challenges of SMEs in China, market access for foreign firms and the opportunities and challenges likely to arise from the Belt and Road Initiative (BRI). Besides, participants of the dinner were given the opportunity to introduce their businesses and to discuss about the recent trends and opportunities in each of their sectors. I think it is important to revisit and emphasize the role of SMEs in the global economy. They create jobs and are usually responsible for over half of the GDP. However, special attention is required in addressing the challenges faced by SMEs; from market access to financing, talent development programmes and knowledge transfer, research and development and maintaining the level playing field are issues that matter to SMEs. The Chinese government has recently begun to take the role of SMEs to the forefront. In a recent executive meeting of the state council of China’s cabinet which was chaired by Premier Li Keqiang, the Chinese government has agreed upon a set of new measures in support of SMEs. These measures included creating a fair and convenient business environment, SME sensitive policies and adequate protection of SMEs in the form of equal treatment in public to tender and access to property and workspace and others. 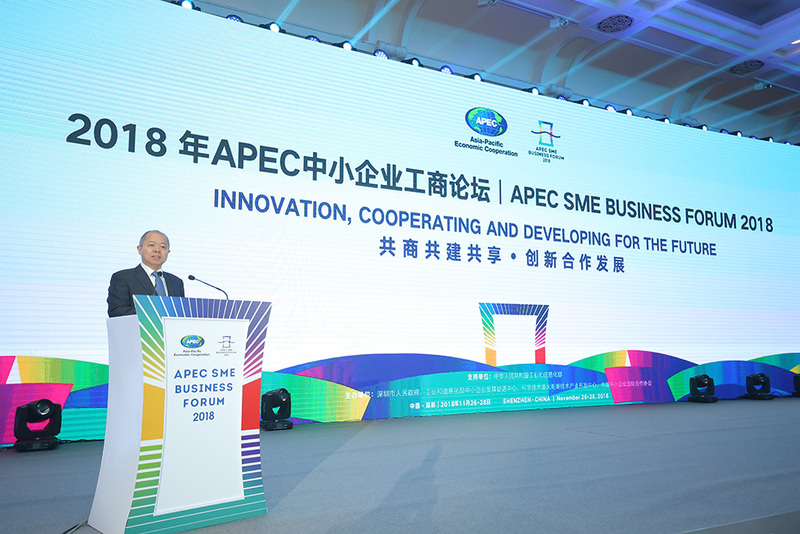 The APEC SME Business Forum was a great success, more so because it was hosted in Shenzhen, a futuristic city which narrates the success story of SMEs led economy. The city is home to a number of Fortune 500 companies and Chinese multinationals such as Vanke, Hytera, Huawei, Shenzhen Airlines, China Nepstar, Ping An Bank, China Merchants Bank (CMB), Tencent. Still, the city’s economy is driven by the over 60% the SMEs that make up its businesses. As a boutique investment advisory firm that specialises in emerging markets and the internationalisation of Chinese firms, nearly 70% of our clients are from the SME sector. We have felt the constraints and challenges of SMEs, but at the same time, we have also identified areas for tremendous growth, especially in the service-led market. In the coming year, we will be focussing our efforts on supporting SMEs with market access and financing as well as working closely with the local and regional authorities and the related Ministries and government bodies to explore the benefits and support available to SMEs. As part of this effort, LC Venture through its Forum of CGG, will be partnering with the International Cooperation Association of SMEs, China Centre for Promotion of SME Development of the Ministry of Industry and Information Technology (MIIT), and the Foshan Municipal People’s Government to participate in the China SME Innovation Service Conference which will be held at Hilton Hotel Foshan, Guangdong Province, from 4th to 5th January 2019. We are delighted to be working with the Chinese Government, thought leaders and industry experts to discuss the drivers, challenges and barriers of SMEs going global. Joining us at the forum include Justin Yifu Lin, former Chief Economist and Senior Vice President of the Work Bank. The theme of the conference is “Opportunities and challenges of SMEs under Belt and Road Initiative” and I would like to extend my warm invitation to all interested to attend the Conference. Picture: Hosting Tunku Ali Redhauddin Muhriz (the eldest son of Malaysian reigning monarch) in Beijing. At the conclusion of the year, I had the privilege of leading led a group of Chinese family enterprises to the first Global Philanthropists Forum organised by the Philanthropist Circle of China (PCC) by a joint initiative of 36 leading business figures that features names like Jack Ma (Alibaba), Pony Ma (Tencent) and Yang Lan (Sun Media) and many others. The event was decked with names like Guojun Shen, founder of Yintai Group, Bo Shao founder of evolve foundation and Matrix Partners China, Tunku Ali Redhauddin ibni Tuanku Muhriz, is the elder son of the reigning monarch Tuanku Muhriz ibni Almarhum Tuanku Munawir, Elliott Donnelley II of the RR Donnelley Family and Peggy Dulany of Synergos, a global non profit organisation fighting poverty, movie star and model Xiaoming Huang and many other philanthropists. It is interesting to learn that 69 of the world’s 100 largest economies are private companies, not countries. When leadership and business thinking apply to charitable giving, it’s not just about writing big cheques anymore but total engagement in act of service and leadership in giving back. The best philanthropists understand that it’s about solving problems, serving others and creating an environment where problems can be addressed in a sustainable manner. They bring the very gifts that made them successful – the drive, the determination, innovative thinking and the philosophy driven by entrepreneurial insight and the refusal to accept that something can’t be done. I saw the 21st Century Philanthropy and I saw how Chinese business moguls are at the forefront. I was actually impressed to see that the majority of them are already heavily involved in education in various capacities and that brings me back to what we do as a company and to what I have made a personal pledge to do. Surrounded by so many high net worth entrepreneurs, the event gave me and the families we brought to the event, a soft reminder for the need to give back. I was very humbled to see the pleasure giving brings to people. What was even more profound, however, was that I found that despite the accumulated wealth and ability of these philanthropists to give, the idea that one has to make big numbers before one can give back is simply not true. I left the event with a feeling that we always have something to give away and if we nurture that, we would always have more to share. While I consider it an immense privilege to be the eldest son and the third Malaysian generation in my family to continue our footprint in China, at the same time, it is also true that with great privilege comes even greater responsibility. Our investments span across a wide range of industries including the automotive, real estate, financial services and hospitality, but our largest investment in China remains in the education sector, where we have the opportunity to interface with the next generation of China’s leaders and influences, to learn from and with them, and to help them develop a more global mindset. important factors so far, and they will continue to be the most crucial for China’s future and BeGo Education is delighted to be playing a small part in this direction. At the heart of BeGo’s commitment is a drive to serve. They do this by enriching the lives of their students and the families that they serve, and creating a social and economic impact on our communities, industries and professions. 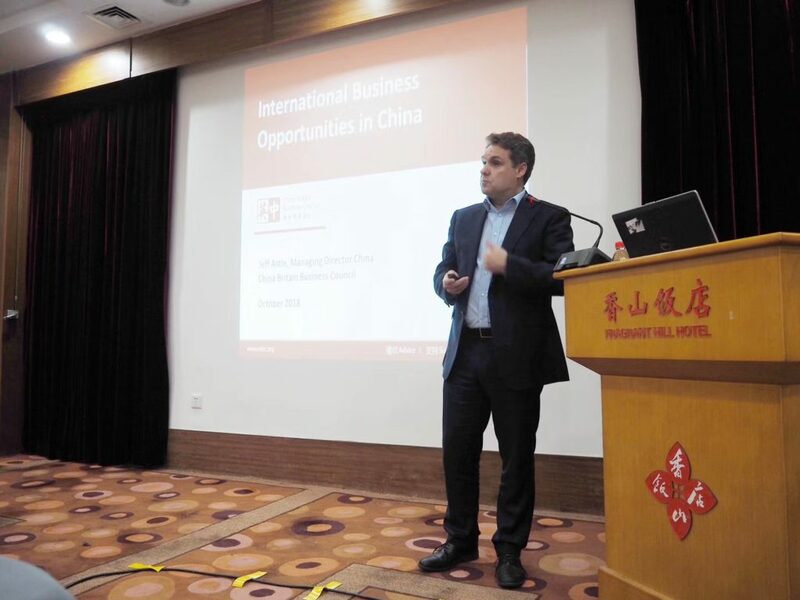 In 2018, BeGo has organised over 15 educational seminars on international education, covering a number of topics from international schools to studying abroad and reaching out to over 1550 families across China. 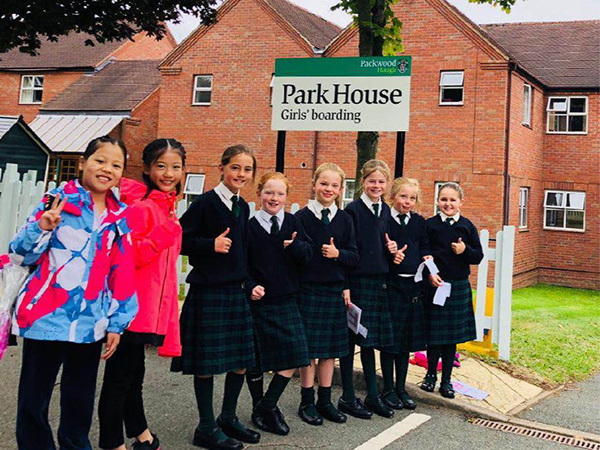 BeGo’s students have been accepted into top schools and universities in the UK, including Harrow School, Dulwich College, Imperial College London and the University of Warwick to name a few. While BeGo continues to assist Chinese families in attaining their educational goals, they also focus on developing the students’ overall skills and abilities, helping each of them to reach their full potential. Looking at 2019, BeGo will be working with world-renowned architecture firm Haskoll to build BeGo Life Skills Learning Centre at the heart of Beijing in Sanlitun. This will also be the new office for BeGo Beijing. The new office space and learning centre is being designed and developed by Haskoll who has been responsible for the futuristic designs such The Oracle, Golden Square; Eden in the UK and the CDO, Manor, Itis in Copenhagen, Switzerland and Finland respectively. Last year, when I wrote the end of the year review, I had announced somethings that were on our to-do list. We have not done all the things we planned, yet we did so much more. Regardless of our projections, we grew. We grew in revenue, we grew in business, we grew in staff numbers, we grew partners and business associates. But more than this all, we grew in character and in heart. I am a firm believer that although hard work and discipline accomplishes much, it is our character that sustains it. Besides, true strength lies in the joy of the heart. Above all that I cherish, above all that I aspire to be, I value the joy at my heart which helps me get up from the bed early and keeps me awake till late. In many ways, my interaction with many of you has fed my joy. On more than many occasions, a simple gesture of goodwill was all it took to get me going and I am glad joy had come to be in many forms through you. I find in my heart to acknowledge and appreciate a few people who have shown unwavering support and for making my personal journey a learning and truly fulfilling experience. Your contribution to the Company, to our work at LC Venture and to me personally is so tremendous. 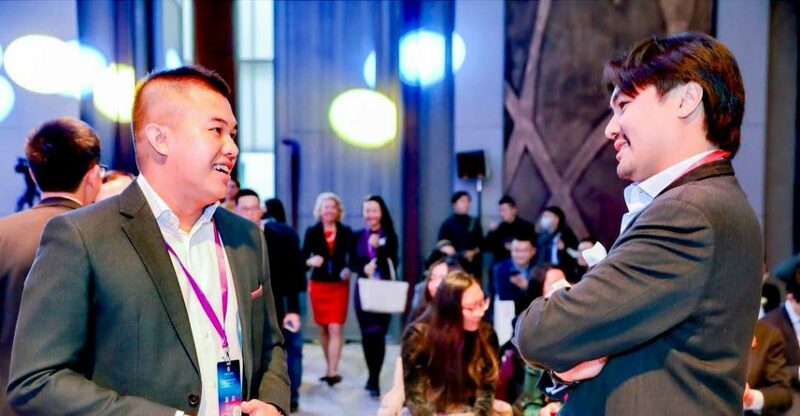 I think only a few people are blessed, as I am, with a business partner and co-founder such as Jennifer Leong, with whom I had the unique privilege to co-found and grow LC Venture in the last almost ten years. Thank you for the camaraderie and partnership and for always pushing me to be a better self. If it were not for your belief when I doubted, your joy when I was weak and your wide grin when I could barely open mine, much of what I am today and what I have accomplished so far would be completely different. I couldn’t have done it without you and thank you for everything. I owe a big thank you to the family members of the Leong and Chee families for their support and understanding and for giving me the freedom to make mistakes and the room to grow. A few other names, including, Oliver Denniss, for setting the bar so much higher than I thought I could reach, and for your continued trust, confidence and sense of adventure. You have been the best investor I could have ever asked for. Martin Barrow, for your profound wisdom, invaluable guidance and priceless advice. Sabina Brady, for your friendship, kindness and for articulating complex matters with honesty and clarity. Clare Pearson, for the energy, enthusiasm and encouragement you bring to the table. Wang Liwei, for your insight into China and the educational programme and charitarian work you wholeheartedly commit yourself in serving. Michale Mehari, for the drive and determination you bring to all our projects and your sense of humour and wittiness that comes along with it. Reggie Sun, my longest serving PA, from my twenties to my thirties, whose loyalty to me is second to none. Your assistance has been ever-present, even when I least expected it. I would also like to thank all the staff at LC Venture for their selfless dedication which is behind our company’s success. To our shareholders and investors, thank you for investing your time and money in our company and for embarking on a journey with LC Venture. In the meantime, I am working on our next event in Foshan, Guangdong Province and looking forward to 2019. I wish everyone a happy and healthy start to the new year.